According to Wikipeda: Sideburns or sideboards are patches of facial hair grown on the sides of the face, extending from the hairline to below the ears and worn with an unbearded chin. 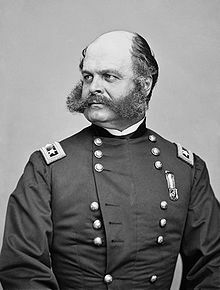 The term sideburns is a 19th-century corruption of the original burnsides, named after American Civil War general Ambrose Burnside, a man known for his unusual facial hairstyle that connected thick sideburns by way of a moustache, but left the chin clean-shaven. “Burnsides” became “sideburns” because of their location on the face and for the somewhat incompetent Burnside’s tendency to “get things the wrong way ’round”. It was a kind of facial adventure to let the sideburns normally only a fraction of an inch below the top of the ear creep further and further south towards the chin. What was neat about the experience is a man didn’t really have to start his sideburns by letting the entire area go unshaven. He could let the regular sideburn get longer little by little so the increase was barely noticed until the whole thing had filled in. They were just there. It was so much fun having sideburns that I failed to notice when men got rid of them. And there I was still looking very much like Elvis (or so I thought) and everyone else looking like they had in the boring days of old. This entry was posted in Appearance, Art, Fashion, Hair, Identity, Manliness, Neatness, Soldier, Youth and tagged artistic expressions, Fashion, Hair, Identity, Masculinity, Self Worth, Shaving, Sideburns. Bookmark the permalink. So, Rich, where the picture of you with sideburns eh? I think I might have one, but it is hideous.